My dilemma all the time! 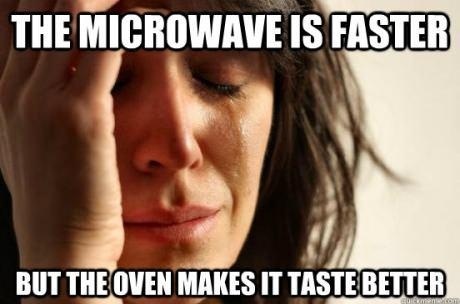 Very true with my macaroni and cheese. Pies and Sausage rolls, chicken nuggets. I don't know. I prefer frozen vegies microwaved over fresh vegies boiled, maybe I'm not doing it right. Fun fact: Frozen veggies are sometimes actually healthier than fresh ones, because they're snap frozen instead of being artificially ripened and stuck on the back of a truck for days. Cool story bro, needs more dragons!